Made this for their parents. Tiberius Claudius Felix, his slave. This inscription from the first century CE was erected by two sons for their parents. Their mother, Claudia Cedne, who is lovingly called “Mamma” in line 5, had been married twice, both times to an attendant of the emperor Nero (reigned 54-68 CE). 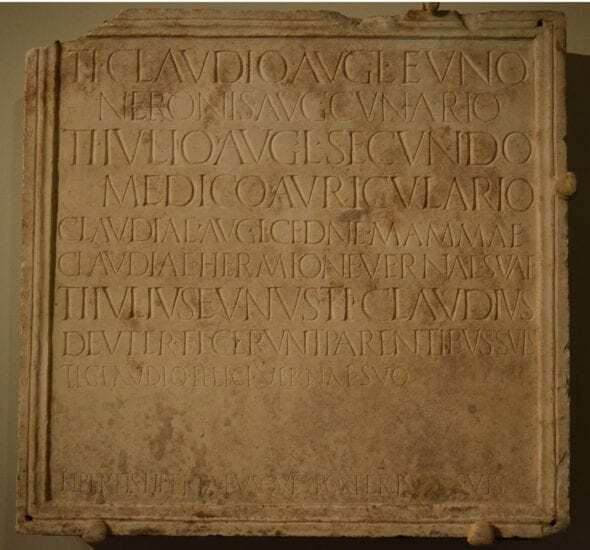 Tiberius Claudius Eunus was the cradle attendant of the infant Nero; and Cedne’s second husband, Tiberius Julius Secundus, was his ear doctor. Both men were freedmen of emperors, and their second names indicate who freed them: Tiberius Claudius Eunus was freed by Claudius (reigned 41-54 CE), while Tiberius Julius Secundus was freed by Tiberius (reigned 14-37 CE) who had been adopted by Augustus and had thereby become a member of the gens Julia. The gens Julia is the family of the Julii, the first dynasty of the Roman Empire. The most famous member was Gaius Julius Caesar who was assassinated on the Ides of March 44 BCE. His adoptive son Augustus became the first emperor in 27 BCE and the dynasty was continued by his successor Tiberius. Space was intentionally left between lines 8 and 10 for the addition of more names. Tiberius Claudius Felix, a slave, died after the original inscription was written and his name was added in that space at a later time. The last line specifies that freedmen and freedwomen of the family are also to be buried in this tomb. D.E.E. Kleiner, S.B. Matheson, I Claudia. Women in Ancient Rome, New Haven, Ct.: Yale University Art Gallery; Austin, Tex. : distributed by University of Texas Press, 1996, p. 211, no. 168. H.L. Wilson, “Latin Inscriptions at the Johns Hopkins University VI,” AJP 31 (1910),25-43, 29-30.